Defensive sprays are only useful if they can be quickly accessed when danger strikes. The MK-3.5 Spray Nylon Holster from Sabre is the convenient solution for reliable pepper spray carry. Its ergonomic design is engineered to securely hold any of Sabre's MK-3.5 series pepper sprays. Featuring a military-grade nylon construction, the case has the durability to withstand the demands of daily tactical use. A hook-n-loop cover flap offers reliable retention to ensure that the sprayer is secured and accessible when it is needed. 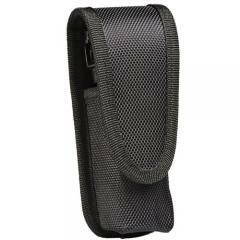 The holster is attached to any duty belt via a rear, universal belt loop.